Oppo UDP 203 4K Blu-ray player review | What Hi-Fi? As we test products, we sometimes wonder if we’re getting blasé about new technology. But then a product like the Oppo UDP-203 comes along and sweeps us off our feet. Ultra HD 4K TVs have been around for a few years now, and while 4K Blu-ray discs and players are still new, we’ve seen more than a couple to get used to the impressive resolution. But Oppo’s first 4K Blu-ray player reminds us just how stunning 4K pictures can be, and takes us back to the early days when 4K videos would make our jaws drop. 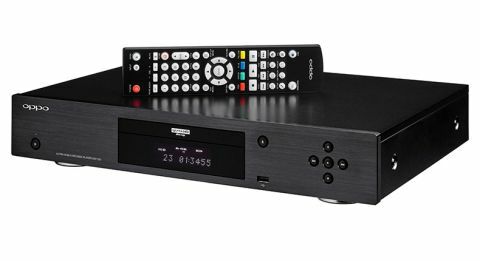 A 4K Blu-ray disc player with HDR, Dolby Atmos and stacks of hi-res music compatibility, the Oppo UDP-203 is in most respects, a well-specified unit. At £650, it’s pricier than our current favourite 4K player – the £600 Panasonic DMP-UB900, which can be found for around £450 now. More pertinently, the Panasonic is our only five-star 4K disc-spinner, until now. The Oppo improves upon the Panasonic in most ways. Life of Pi in 4K Blu-ray looks spectacular. The colourful scenes of Pi stranded on the vast ocean while the sun sets around him are breathtakingly crisp and vivid. The amount of detail conveyed by the Oppo UDP-203 outshines the Panasonic DMP-UB900. Every ounce of detail – from the rough texture of his sun-exposed skin to the silky smooth clear water – is etched out with superb clarity and subtlety. Each strand of the CGI tiger’s fur looks so tactile that you want to reach out and pet him. Colours are effusive, inviting you to look deeper into every inch of the screen. The Oppo goes for an appealing colour balance that’s aimed to impress – reds, blues and yellows are richly hued – but they don’t ever look unnatural. The player’s talents don’t get any less exciting when watching normal Full HD Blu-ray. Switch to a more natural-looking palette such as The Imitation Game , and the skin tones are nicely textured and shaded in a realistic manner. Motion is stable, too, keeping the action smooth even when faced with tricky slow-panning shots. Bright whites and dark blacks are handled expertly. The white text on computer screens in The Martian (4K Blu-ray) is stark and clean against smooth blues. Reflections shine in a way that’s appealing, while the vast Martian landscape is perfect for showing off the various red, brown, orange hues on the 4K HDR disc. There’s a certain glossiness to the Oppo’s picture that makes it alluring, but it does so without compromising its hold on reality. Characters and objects seem to pop out in a most impressive manner, too, keeping your attention hooked to the pictures. That’s down to the layers upon layers of subtlety brought out by the Oppo. It makes more of a disc (4K or Full HD) than the Panasonic UB900 does: more clarity, more detail and more gradations of shading. The player’s upscaling talents should be commended as well. Once you adjust to the fuzziness of Ocean’s Eleven on DVD, the picture still holds up in terms of punch and colour dynamism. It’s more detailed and less patchy than the Panasonic’s handling of DVDs. There is scope to tweak the picture using Oppo’s image processing system, but it’s not subtle enough to make any useful improvements. We’d stick to fine-tuning your TV or projector’s picture when needed. The Oppo does the same thing with sound as it does with its picture: give us more. Star Trek Beyond’s soundtrack is a grand, dynamic affair. There’s a rousing sense of build up as Michael Giacchino’s score blares through our reference speakers, with the Oppo handling the orchestral dips and soars with plenty of grip and precision. Detail is crisp and punchy, too. There’s a real solid smack when aliens thud against glass windows, for instance, while voices go that bit deeper, sounding more natural and expressive. That richness and snappy sense of rhythm comes through with two-channel music as well. Play Okkervil River’s Lost Coastlines on CD, and the jangly guitars are packed with texture and bite, the vocals shine through, and the melody is lively and full of engaging detail. The Oppo UDP-203 isn’t just a 4K Blu-ray player; it’s a universal player in every sense. It will play 4K and Full HD Blu-rays (2D and 3D), DVDs and CDs. It’ll even play DVD-Audio and SACDs – which the Panasonic UB900 doesn’t. There are two HDMI outputs on the Oppo: an HDMI 2.0 for video and audio, and an HDMI 1.4 for sending audio signals only for older receivers. The UDP-203 comes equipped with the latest HDCP2.2 specification, meaning it adheres to the BT.2020 colour gamut standard set by the UHD Alliance. While the player currently supports the standard HDR format, HDR10 (present in all current 4K Blu-ray discs), it will be adding Dolby Vision HDR via a firmware update later in the year. Unlike rival players, the UDP-203 doesn’t come with any video streaming apps such as Netflix or YouTube on board. Oppo says this is to ensure the player is fast to boot up (which it does). Since your 4K TV is already likely to have the relevant apps – Netflix, Amazon Video, BBC iPlayer and more – we hardly missed the lack of smart apps in the Oppo. There’s also the fairly affordable option of plugging in streaming devices such as the Google Chromecast Ultra or the Amazon Fire 4K TV box into the Oppo’s sole HDMI input to give it smart functionality. Inside the Oppo lies a 32-bit/384kHz DAC capable of playing lossless hi-res files up to 24-bit/192kHz and multiple DSD formats. All popular music files are supported, too. Connect the player to your home network – wi-fi and wired are both swift, but we’d pick the wired route for extra stability – and you’ll be able to stream your entire music library from your NAS box and other connected devices. Add in 7.1-channel analogue outputs for older, non-HDMI receivers, three USB ports for playing media files (they’ll charge your smartphone, too) and two digital inputs (coaxial and optical), and you have an impressive list of connections from the UDP-203. The last Oppo disc player we tested, the superb BDP-105D (£1100), was a rather old-fashioned looking hunk of metal. The UDP-203, however, has been housed in a sturdy metal chassis that’s surprisingly sleek for Oppo. With its clean lines, brushed aluminium front panel, minimal buttons and neat display, it’s more reminiscent of the Cambridge CXU universal player – and that’s no bad thing. It looks smart, and will easily disappear into your home cinema room. The display is clear and informative, and also dimmable. The buttons are responsive, and the 4K disc loader itself is fast and fairly quiet in operation. The remote is big and chunky, but it’s intuitive to use. Not only do the big buttons work responsively with the player and its simple interface, the remote’s backlight is also motion triggered – a genuinely useful feature that we wish more manufacturers would implement. Is the Oppo UDP-203 the new 4K Blu-ray player of choice? Certainly. While the Panasonic DMP-UB900 remains a five-star performer, the Oppo is the more impressive out of the two when it comes to enjoying films. The Oppo simply reveals more layers of subtlety than the Panasonic, giving you more impetus to be drawn into what you’re watching. You don’t have to be a connoisseur of 4K discs to enjoy the Oppo, either. It’s just as enjoyable and discerning when playing normal Blu-rays and DVDs, and its music credentials are worth making a song and dance about, too. And we’re more than happy to sing the Oppo 203’s praises. It may be a touch pricey, but that sense of awe you get when watching 4K films is worth every penny. We’d start adding it to your home cinema wish list right now.